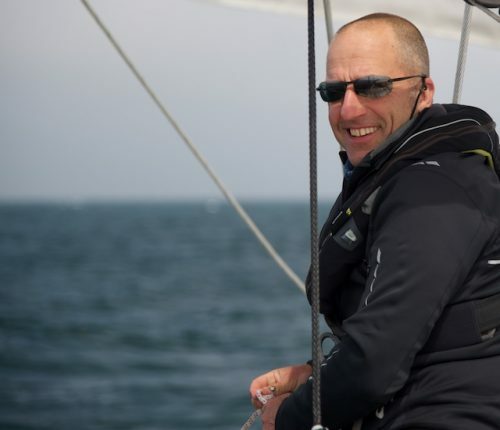 “There are some skippers with whom people come back for sail over and over again…” (Tom Cunliffe). Clearly, this is the wish I have now, after sailing my first leg with Leon on his Regina Laska. With his incredible knowledge and skills, Leon is able to give the crew valuable tips and tricks. He is not getting tired answering all our questions. 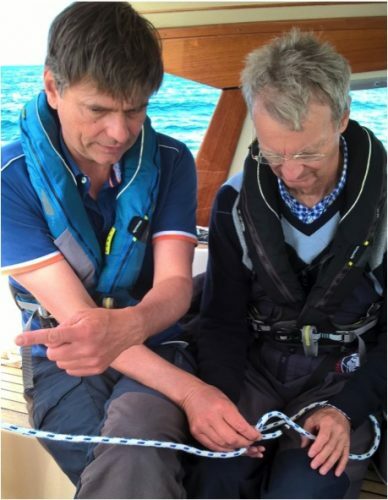 Just press the button, and he begins… and then, he provides us with profound expertise about navigation, radar handling, tidal calculation, rig trim, man over board maneuver, ropework, …you name it. Leon showing our crew-mate Stefan some knots. 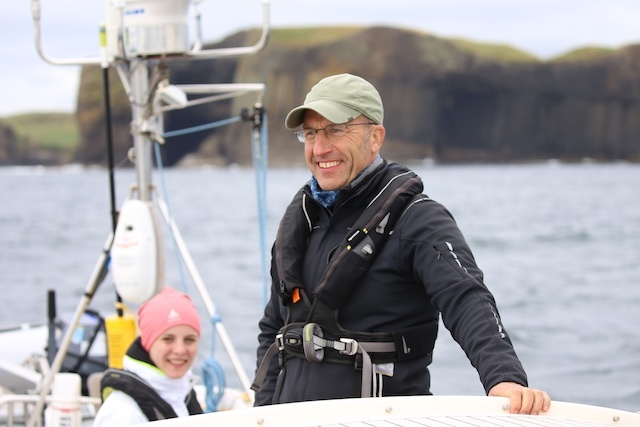 Leon is not only taking care of navigating the boat safely through ocean waters, but he’s giving the crew a big share of the responsibility in handling the boat as well! 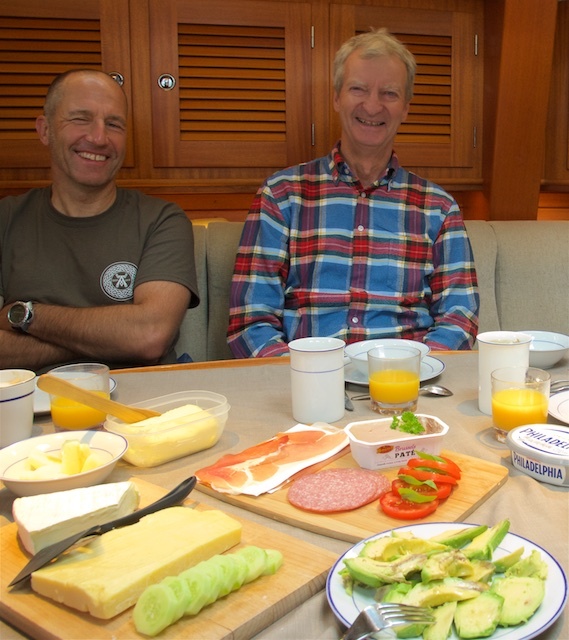 In between, he prepares wonderful meals twice a day, which give the crew the feeling to be on a luxury cruise, rather than travelling on a sailing vessel. Last but not least, there is also interesting background information and experience about cultural aspects of the area, e.g. listening to F. Mendelssohn Bartholdi’s Hebrides Overture when passing the island of Staffa, whisky tasting on board Regina Laska, as well as visiting a distillery doing the same, listening to Leon’s stories about the history of the Iona Abbey and passing Mull of Kintyre accompanied by Paul McCartney`s song of the same name. 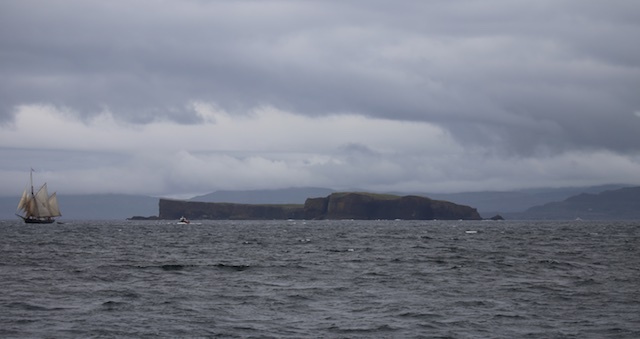 Passing Staffa in the background with the famous Fingal’s cave. 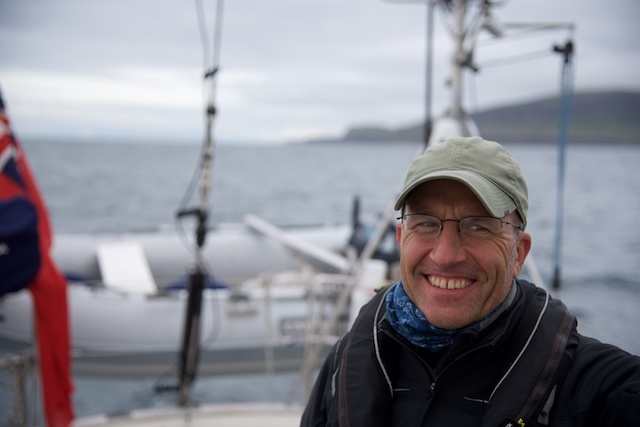 Leon served Mendelsohn’s Hebridean symphony on his great onboard stereo system while passing. 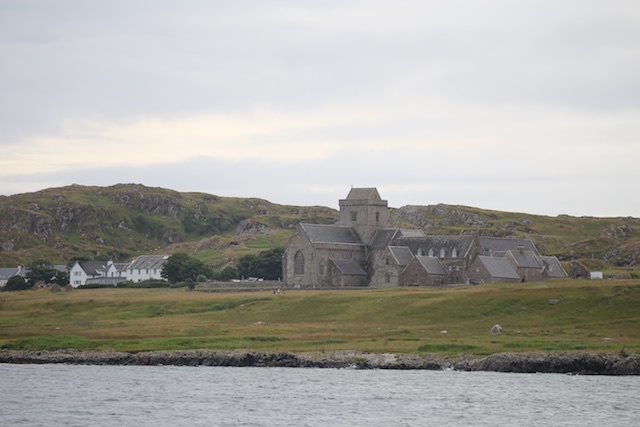 Passing the old monastery on Iona. From here, the entire Great Britain once was christened. 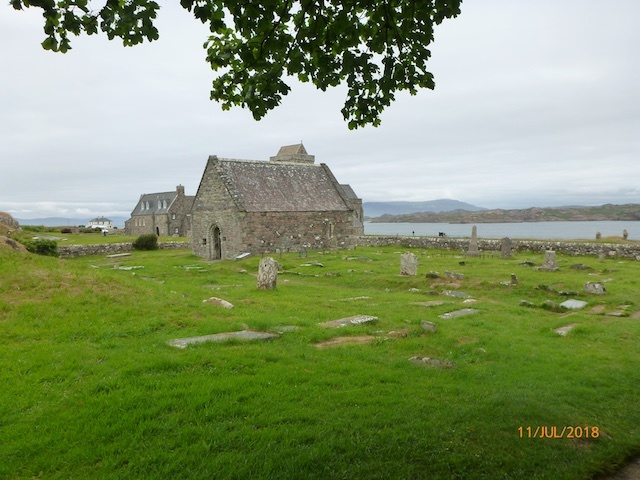 The old chapel on Iona is dating back to the late Viking age, who once were “visiting” these islands with a more or less friendly business oriented mission. 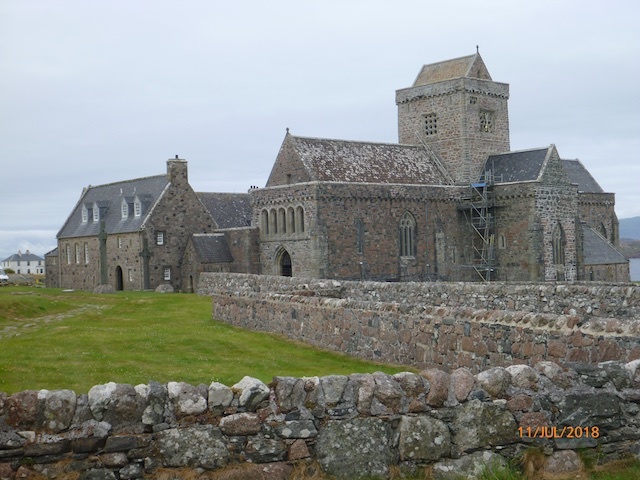 We anchored outside Iona and visited the monastery. When we were passing the notorious Mull of Kintyre, Leon was playing the song with Paul McCartney singing together with bagpipes. It was so cool! A very comfortable boat. Having enough space for the private equipment and well-shaped beds. What impressed me most, were the many special features provided by Leon, not only in safety-, or navigational equipment, but also in things that make life on board very pleasant. 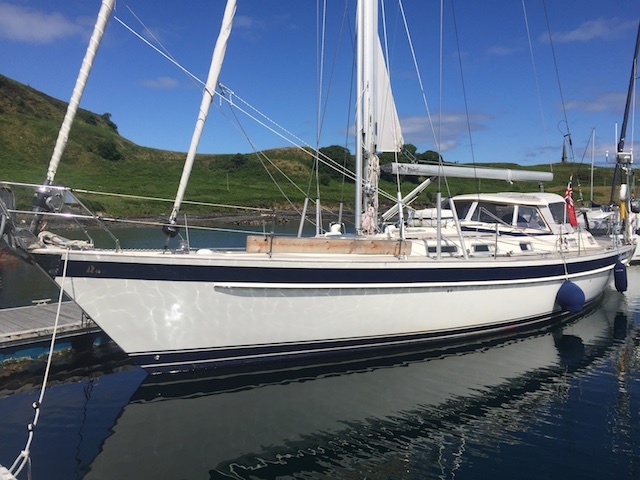 Continuous electric power, finest fizzy tap drinking water (thanks to his sub-micron filter combined with a Sodastream), a freezer, the superb sound system, electric toilet flush, Nespresso coffee maker, outdoor grill and after all the on-board steam spa. 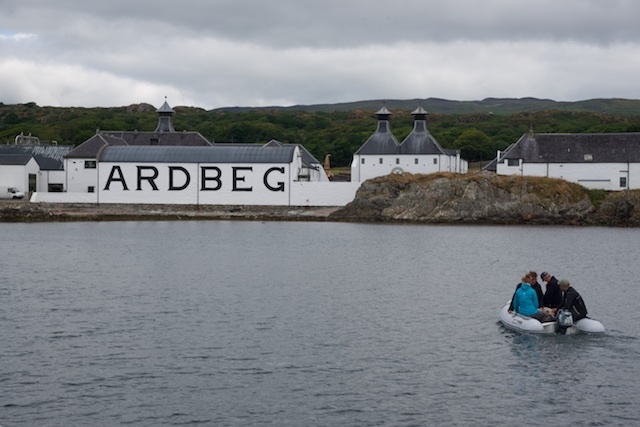 Maybe the best was using the sauna in front of the Ardbeg distillery. It was such a unique experience. Sauna in front of the Ardbeg Distillery! Another of these unforgettable moments! 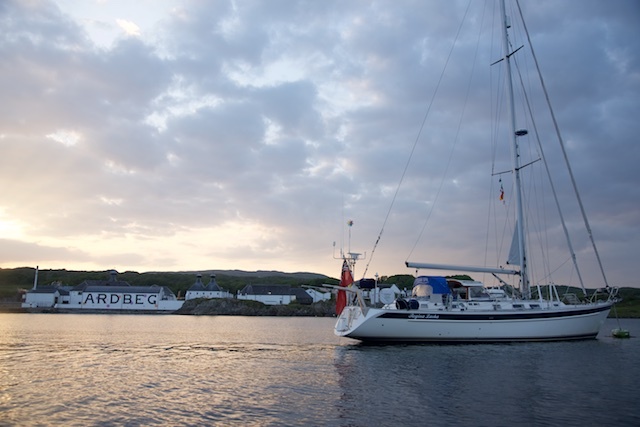 Taking the dinghy in to the distillery for a tour the next morning. 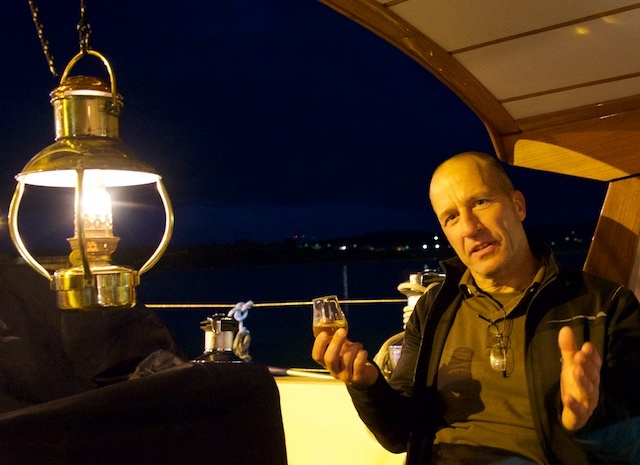 We were the only ones on the tour not swallowing the whisky, since we were off to sail later the same day. Too bad! Kerrera Island, where our cruise began outside Oban. 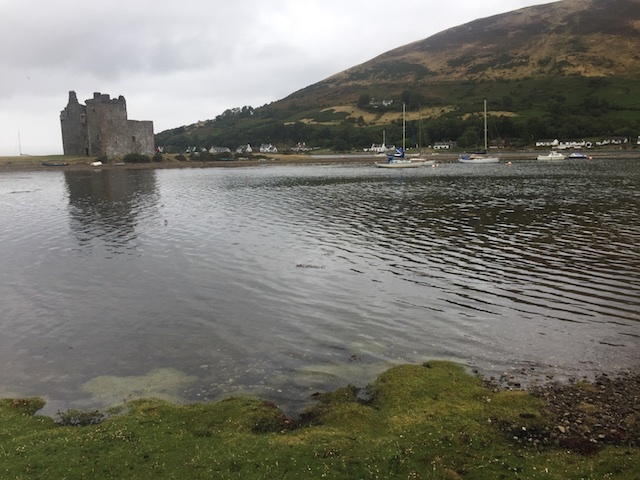 With the area we sailed being a small part of the Celtic belt, I am getting curious to learn and see more from these Celtic nations and seas. It is an impressive landscape, somewhat demanding for sailors. Therefore, with a good chance, one can sail for hours alone over the seas without seeing any other vessel. This is a big contrast to other sailing hotspots I knew before. One of the very few other vessels we spotted. 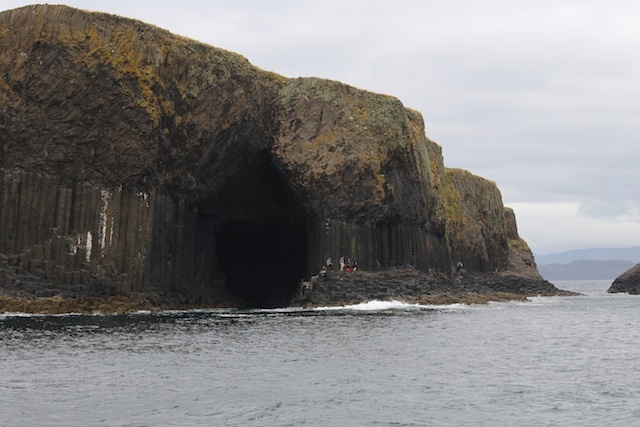 Here, in front of Staffa. BBQ Time on aft deck with the great crew! 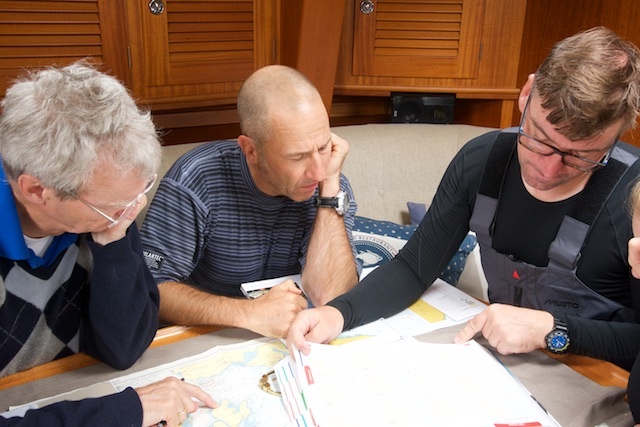 We were a good mixture, having different levels of sailing background and age. The daily routine went very smoothly and it was interesting to see, how each of us developed his own expertise e.g. calculating streams and tides, ropework with all kind of knots and handling the boat. 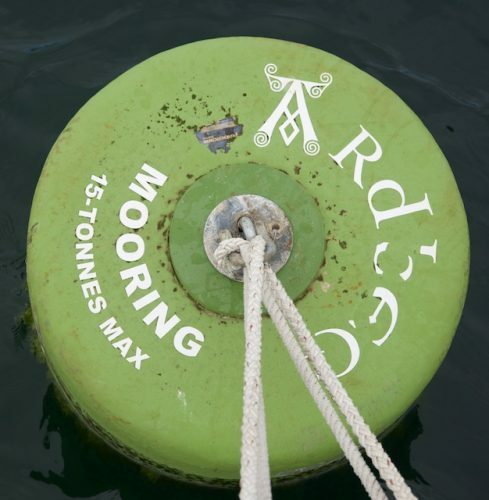 What I`d like to point out were our long evenings on board. With a perfect dinner, decent drinks and good discussions ’till early morning. Late night discussions about life and the world, work and sail, plastics in the Ocean and other environmental issues… anything essential to understand why we live in this wonderful world. It’s this atmosphere on Regina Laska why I wish to return!!! At the end it felt like a cruise with good old friends. 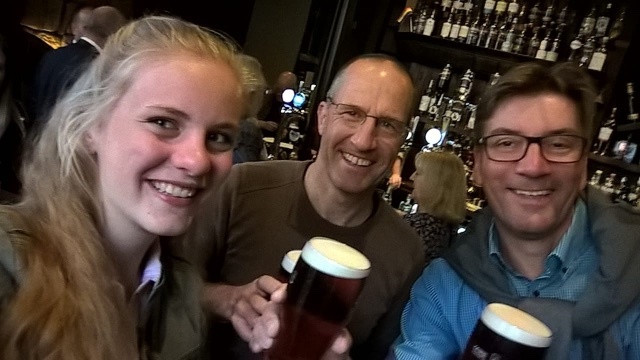 When we left Regina Laska, the crew took the train together to Glasgow. 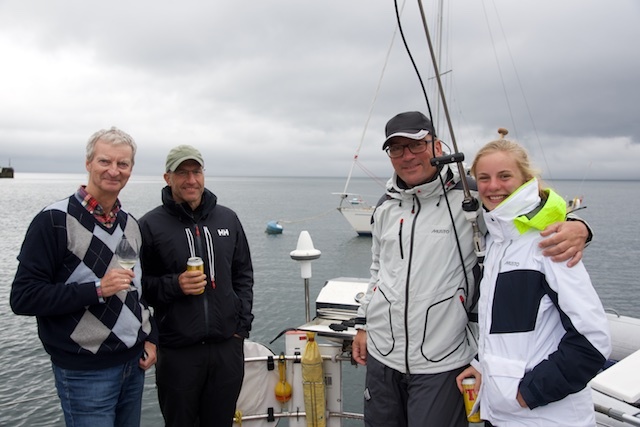 There, enjoyed a last great evening together as a crew (without Leon, who was preparing the boat for his next crew)! 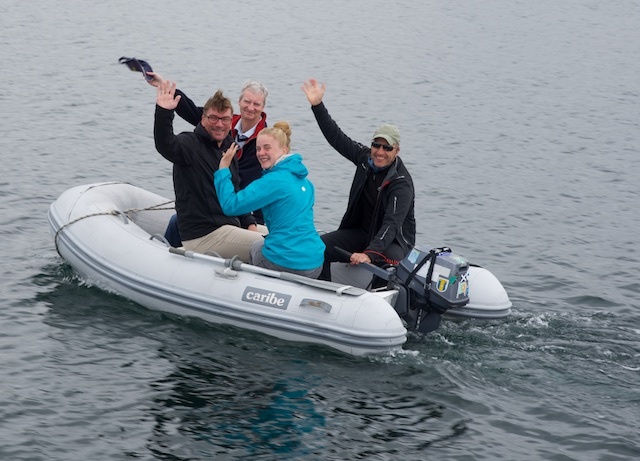 I have definitely made new friends, and I really look forward to seeing them all again at the Reginasailing Safety Course in November! 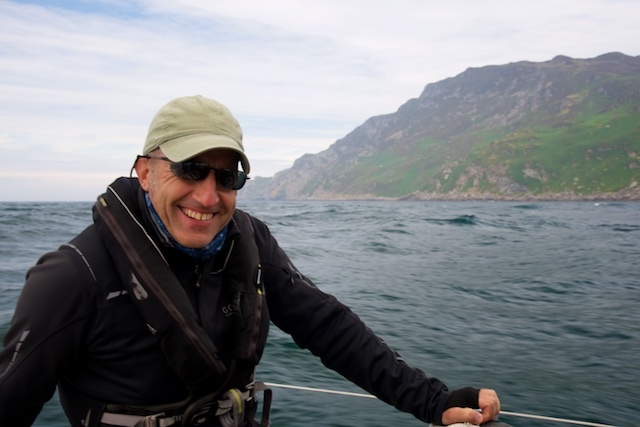 Ludwig Obermeier, Germany, sailing leg 8-2018 from Oban to Troon in Scotland.